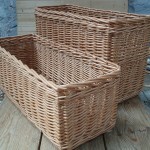 When you are deciding on the look of your basket there are choices for the willow colour, border, weave and handles. 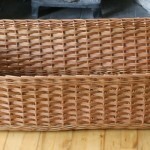 In the Custom Made Basket Options sections below we’ve grouped together some baskets according to a combination of weave and border to give you an idea of how your baskets might look. Take a look at each section and choose the style you like the best. 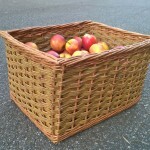 There’s information as well – about which weave suits which kind of basket and things to consider when choosing the border. We’re here to help, so please feel free to call Alison on 01294 829012 or email with your questions or for a quotation and advice. 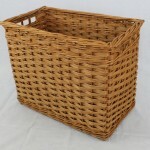 We want to help you create the perfect basket for your home. Check out the customer photo gallery page. 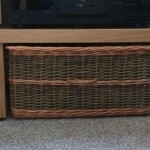 Useful pictures sent in by customers of their baskets in-situ. 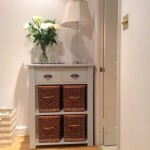 4 willow colours: buff, natural white, steamed (dark brown) and natural green. 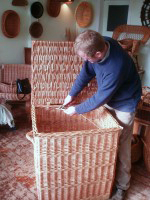 When working out the size you’ll need for your baskets, we recommend allowing 2cm on the width. 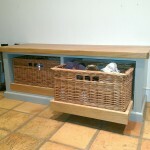 The height and depth is up to you, but you’ll need at least 1cm clearance for the height. 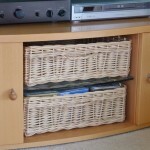 For the depth you may also want to allow 1cm so that you have the option of sitting the baskets slightly back from the front edge. As basketmaking is a hand craft using natural materials that have variation in thickness, we cannot always achieve exact measurements. We take the size given as the maximum external top measurements and aim to get as close as we can without exceeding them. 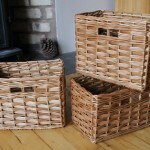 As a result your baskets may be slightly smaller, but should never be bigger. Please give Alison a call on 01294 829012 if you need any further information, or help. 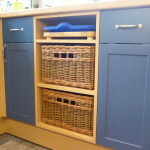 Customers often email photographs of the unit, or the room the baskets will go into and using this we can give advice as to the border or colours to go for, or any other help or advice that you may find useful.